The May Cloud Community of Interest (COIN) Tech Talk was provided by our Oracle Cloud Services partner. Clarke C., Senior Manager within Oracle’s Public Sector Solutions Engineering team and Glenn A., Account Manager for Oracle’s Platform Technology, led the discussion. Clarke discussed Oracle’s strategic approach of using “Journeys to the Cloud” scenarios for migration, SaaS adoption, modernization, optimization, and analytics to transform business using the Oracle Cloud Platform. Oracle has quickly developed an impressive array of services that emphasizes Open Source, compute options such as bare metal, elastic, container service, and specialized dedicated and engineered systems. The Exadata Cloud is a powerful feature that integrates Oracle database innovations with Exadata database machines to provide a highly compatible, scalable, and secure database environment for mission critical application deployments. Oracle is heavily investing in what it calls “Autonomous Platform Services”. These Autonomous Services are built with advanced artificial intelligence (AI) and machine-learning (ML) algorithms. They offer self-driving, self-securing, and self-repairing capabilities that take PaaS capabilities to a new level for data management, application development, analytics, and security. 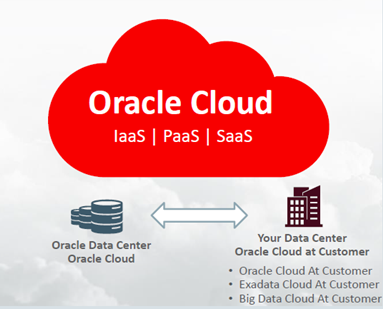 Another interesting and innovative feature of the Oracle Cloud Platform offering is called “Cloud at Customer”. Customers can choose their deployment option to be in the Oracle Cloud, in an on premise/behind the firewall Oracle Cloud that is remotely managed by Oracle, or managed by the customer. Oracle claims that this approach provides one fully secure platform from development through production with full workload portability and it enables rapid application development across public and private clouds with no rewrites or modifications required. Oracle has made extensive progress in developing its Cloud service capabilities recently and we look forward to a deeper and continued relationship in our ActioNet – Oracle Partnership.